The Canada Water residential development by Barratt East London comprises three courtyards situated near to Canada Water tube station and a proposed civic square. 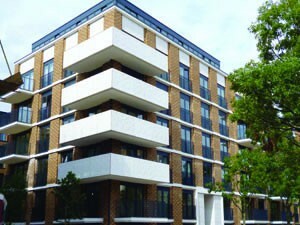 Detailed designs were prepared by award-winning architect Glenn Howells Associates. This practice has a stated policy of connecting building design to the local culture and tradition. The parcels of land that were acquired for Part A of the Canada Water development are located next to the only freshwater lake in south-east London. The area was named after the original Canada Docks, which for many years was the destination port of ships sailing to London from Canada. To create a connection with the area, Glenn Howells’ design concept incorporated large-scale concrete cladding panels at entrance, balcony and roof level, which featured a repeating Canadian maple leaf design. Given the size of these panels, some of which were over 3m², the use of GRC was an obvious choice to both reduce dead load on the structure and allow for ease of installation. 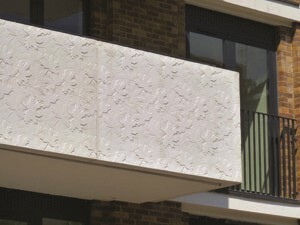 Once the project reached construction stage Barratt East London invited GRC UK to attempt to produce figurative panels, with the required level of highresolution detail. Realising the technical requirements needed to manufacture mould liners with this repeating pattern, GRC UK contacted the Faculty of Arts Design and Technology at the University of Derby in order to collaborate in the development of a new digital solution, which would be able to respond fully to the technical, aesthetic and commercial tendering requirements of the Barratt project. Under the protection of a mutual non-disclosure agreement, GRC UK was able to identify to the university the distinctive parameters required of the form liner moulds for GRC, particularly in comparison to those for precast concrete, which is poured rather than sprayed. Critically, mould-release processes for GRC demand that between every level in low-relief patterning a nondirectional gradient bevel has to be achieved. In addition the obligation was identified to create an irregular pattern unit of 720 × 950mm that could be tessellated seamlessly up to the maximum size of the architectural panels, 3 × 1.5m, while attaining a variegated depth to a maximum of 8mm. The master formliner mould had to be produced as a physical negative of the eventual positive concrete panels, with high points inverted to low points and vice versa. The architect for Barratt East London provided a linear rendition of the patterning motifs, stylised maple leaves and an indication of their general scale and multi-directional distribution. A further consideration was that GRC UK had taken the decision to replicate and join together, in-house, numerous rubber positives from the negative master formliner to produce several final full-scale negative formliner mats. These would then receive the sprayed GRC to create the final positive concrete panels. The implication of this decision was that it would also be necessary to find a digital means of providing a precise perimeter ‘formwork’ for the mould itself. Armed with this detailed briefing, the university undertook exhaustive experimentation with digital imaging and laser control software, in combination with a diverse range of materials, to define a novel methodology to create the master formliner mould and ‘formwork’, which enabled rubber sectional mould liners to be produced. Once the negative master had been manufactured by the university it was delivered to GRC UK who produced the irregular sections using high-quality Reckli materials. Due to the dimensional stability of the finished rubber and the accurate production of the master shuttering, it was then possible to produce a full-size positive master in rubber. This of course then allowed numerous negative mould liners to be produced, which were cut down to the required size. 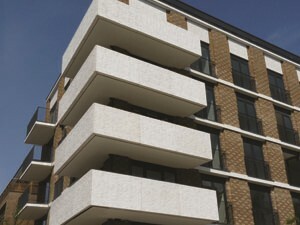 The process delivered high-quality GRC panels, which required no further finishing or treatment. De-moulding was of course simplified with the rubber liners simply being pulled away from the architectural face. 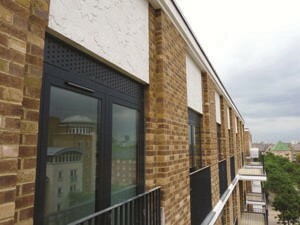 The high strength of the GRC allowed even the smallest detail to be produced without the fear of damage. The issue of damage was of course a real concern as all the panels were to be installed by GRC UK site teams as a supply and fit package. If any architectural faces had been damaged, repair would simply not have been possible. The finished project demonstrates exactly what can be achieved using a digital image transfer, skilled pattern making and the Reckli product. It allows GRC panels to be manufactured that are only limited by the designer’s imagination and an opportunity to create truly unique buildings.